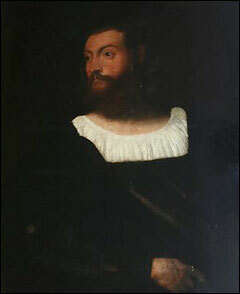 Despite my initial scepticism, I am now quite convinced that the possible Titian sold for a song at Gilding’s, Leics. last week (pictured, above left), is the genuine article (as convinced as is possible without having actually seen the painting firsthand, that is). I’ve now had the opportunity to examine the enlargable lot image at the Gilding’s website, which is far from perfect but still way better than the muddled reproduction that’s been floating around the web, and which you see here. The picture is obviously of high quality and fits well into the group of portraits of unidentified gentlemen, clad mainly in black and white, that Titian painted in the second half of the 1510s and the early 1520s, before hitting the major league as a portraitist a few years later. A good number of these portraits are still extant – the most famous being the so-called Man with the Glove at the Louvre, but it stands to reason that he did many more. It is not thus not surprising that another one should turn up this way. 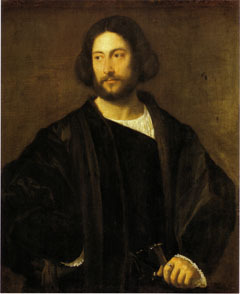 The painting would probably benefit from a cleaning, and it is in any case hard to make out details of handling in especially the dark areas, even when magnified, but it carries many of the characteristics of Titian’s approach. The face, which initially struck me as a bit smooth and flat in its modeling, consists of the typical build-up of flesh tones on top of a reddish-brown ground, the midtones interlaced with pink, and scumbled whitish layers providing the highlights. 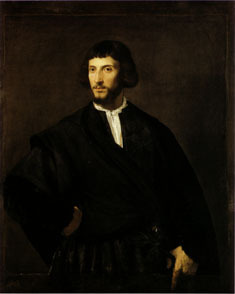 While Titian is often more nuanced in these areas than he appears to be here, there are several portraits of comparable smoothness of rendering, such as the magnificent Maltese Knight in the Uffizi, or the less striking Portrait of a Man at the Musée de Beaux-Arts in Besançon (pictured, at the top, right), which is generally accepted as autograph (I haven’t seen it in the flesh, so I can’t weigh in). The apparently vascular character of the flesh on the hand, which was the other cause of my scepticism, is rather uncharacteristic, but the magnification indicates that this impression of mine is probably largely the result of abrasion of this area. And, in any case, it is not unlike the way the left hand of the Young Man with a Goatee in the Louvre (pictured, above right) is painted. The only area that to me does not seem up to snuff is the one around the neck and the white shirt. These seem rather too pasty and homogenous, and thus uncharacteristic of Titian’s light, scumbled touch in such areas. 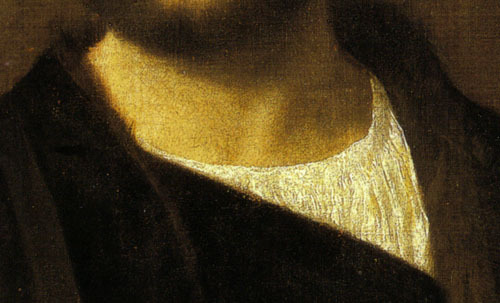 Compare, for example, the dryly painted, finely modulated shirt and the subtle shading and modeling of the neck of the Bearded Man in Munich (pictured at above, left). But, again, the handling here does not seem out of step with that in the Besançon portrait, or even the fine, small Portrait of a Man in the Metropolitan Museum in New York. 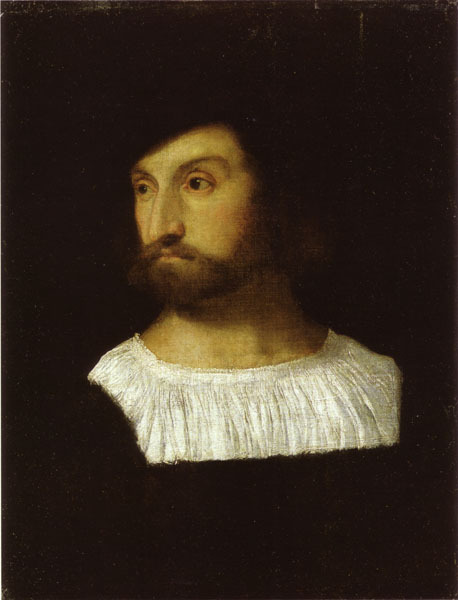 And it is clearly more sophisticated than that in the comparatively weak, probably restored Portrait of a Man in the Pitti (which, if by Titian, must have been extensively repainted and lost much of its original lustre). The explanation may similarly be that this area has been subsequently repainted, or my impression could – again – largely be due to the inaccuracy of the reproduction. Tom Flynn speculates that the sale might lead to a lawsuit from the previous owner, whose £205.000 may suddenly seem like small beans, if the portrait is established as the Titian I now believe it is. Also, The Guardian has a bit more on the sale.